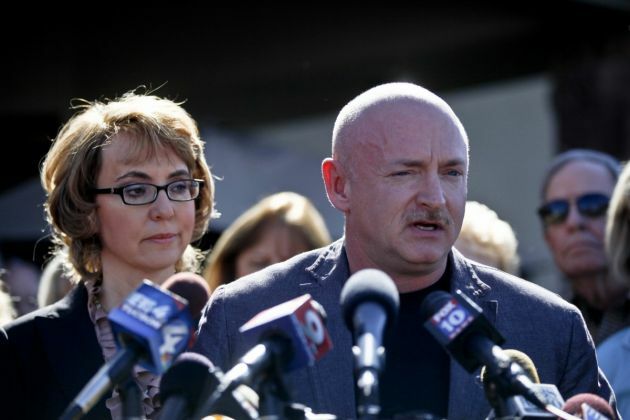 (Photo: Reuters / Samantha Sais)Former congresswoman Gabrielle Giffords listens as her husband Mark Kelly addresses a news conference for victims of the Jan. 8, 2011 Tucson shooting, at the Safeway grocery store parking lot where Giffords was shot during the incident. The March 6, 2013 news conference in Tucson was held to urge action on common sense solutions to reduce gun violence, including universal background checks, are being debated in the U.S. Congress. In the first open response from gun control advocates in the wake of last week's vote in the U.S. Senate, new radio ads emerged Wednesday targeting two Republican Party senators. Americans for Responsible Solutions (ARS), an interest group founded by former Rep. Gabrielle Giffords (D-Ariz.) and her husband Mark Kelly, released new commercials. These were meant to criticize Senate Minority Leader Mitch McConnell (R-Ky.) and Sen. Kelly Ayotte (R.-NH) for voting against "common sense" measures intended to keep firearms away from criminals. The commercials mark the first real attempt of a pro-gun control group intent on doing political damage to lawmakers from the National Rifle Association (NRA). On Jan. 8, 2011, Giffords was herself a victim of a shooting near Tucson at a supermarket where she was meeting publicly with constituents. The shooting was reported as an attempt on her life and she was critically injured by a gunshot wound to the head, but has recovered after intensive treatment. Aiming to punish Republicans who filibustered universal background checks out of a vote last week, the ads specifically take umbrage with the GOP leadership in the Senate. McConnell will face reelection in 2014, though he has not yet attracted a major Democratic rival for his red-leaning state. Conversely, Ayotte does not have to run again until 2016, but he will be more vulnerable in the swing state of New Hampshire. Groups like ARS are betting on public support to help do political damage to Republican politicians who helped the stall serious gun control reform. ARS itself has received 24,000 donations in just the last week since the Senate vote. They have promised more ads to come out this week. A new Pew Research Center/Washington Post poll released Wednesday showed that 47 percent of Americans were either "angry" or "disappointed" at last week's filibuster while 39 percent showed positive responses. These numbers display a deeper divide than the oft-cited Quinnipiac poll released at the beginning of the month, which showed 91 percent of Americans favored background checks. Ecumenical leaders and inter-faith groups in support of gun violence prevention have shown similar distraught over last week's Senate vote. "The Senate's failure to act is a sobering reminder of the amount of work we in the faith community have yet to do as we continue to speak and work on behalf of the victims of gun violence in America," said Rev. Gary Hall of the Washington National Cathedral in a statement. "The only people strengthened by [the Senate's] action are gun traffickers, criminals, terrorists, urban gang members, and those disturbed people who seek to solve their own internal problems by carrying out public assaults…"
Other pro-gun control groups, such as New York City Mayor Michael Bloomberg's Mayors Against Illegal Guns, have also vowed political retribution on lawmakers who opposed the tighter regulations. Giffords herself was a victim of a mass shooting in January 2011 when a gunman fired on her and a crowd of supporters in Tucson, Arizona. Nineteen people were hit in the chaos, six of whom, including nine-year-old Christina-Taylor Green, died.